Feather edge (also known simply as Leeds or shell-edge) was my first real antiques passion. I began collecting it about 25 years ago and it remains my largest collection. It was made in the Leeds area of England from approximately 1775 through the 1860's. Many of my better pieces were purchased from Lisa McAllister, long before the advent of the internet. She is the author of a book about feather edge. Blue is by far the most common color, followed by green and red. I believe it can also be found in yellow, black and brown. All my pieces are blue except for one piece in green. There is a very informative article about feather edge in the August 2009 issue of Early American Life, though they refer to it as shell-edge and state that the term feather edge is a misnomer. Below is the cupboard in my dining room. A close-up of pepper pots and a highly decorated plate. The lid of a tureen with a beautiful rose finial and hand painted "onions" encircling it. Another tureen lid, also with a rose. I do not have the base to either of these pieces. One of my favorite plates. I love the "onions" painted on this plate, the same design as on the tureen lid. I also have a set of matching platters with this design. My corner cupboard in the living room housing more of my collection. This large tureen (also with a rose finial) is by far my most valuable piece of feather edge. It is in mint condition. ...and a close-up of the detail. Many of the pieces in my collection have cracks and chips, but if I was that old, I'd have cracks and chips, too. Heck, I'm not nearly that old and feel I am "cracked"! Thank you for stopping by to view my collection! I thought my penny tongues came out good (a little off center, but that's ok) and would be perfect on my cat mat. This is my first penny rug and I wanted it to be exceptional. HA! Speaking of my grandson, I picked him up after work today. I took him to visit his great grandma (my mom). Then we came home, got Marvin and walked over to the school playground. Jake has turned into a real magpie and doesn't stay still for a minute. It's hard to get a good picture of him. He has the most wonderful red hair that I'm sure he will learn to hate! Being the typical boy, he must go UP the slide. Thank you for dropping in. I hope your weekend is off to a great start! What do you think? Don't you just love it??? My older son that lives in Las Vegas sent me this photo. 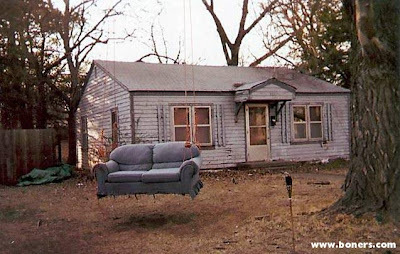 I always told my boys there are certain rules of decorum one must follow when living in a house or apartment, and the #1 rule is no indoor upholstered pieces or appliances are allowed on porches or balconies. I guess hanging from a tree is okay? Aren't these the most beautiful hanging baskets? They are all around the square in Oberlin, Ohio. I have absolutely no luck with sweet potato vine. For this late in the season, I can't believe how lush they still are. Oh, weekends just fly by too quickly. Saturday was a little crazy. I was dropping my foster, Marvin, at a dog event while I headed to Malabar Farm for the "In the Spirit of Friends" show. It was a perfect day for an outdoor show. I was supposed to drop Marvin off at 9:30, then it was 10:00, then got pushed back to almost 10:30. So my bud Belinda and I head off to Malabar ~ over an hour away. Well, with the detour we had it was WAY more than an hour. The show was wonderful, but I felt so rushed I really didn't have time to enjoy it. 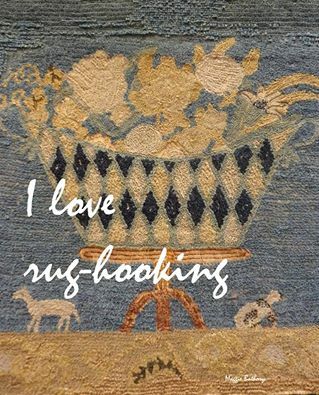 There were some wonderful primitive crafts, great antiques, and LOTS of hooked rugs for sale, along with some gorgeous wool for sale by Alice at Folk Art Primitives and the Ault's. I had the pleasure of meeting Bobbie from Union Star Primitives (and the Evening Stitcher), Julie from Plum Run Creek and Sherry, from Sherry's Heart. I ran into a few of my hookin' buddies. You can see their picture over at Julie's blog. I was just too good! I guess it's because I'm still trying to pay for my Townsend cutter (which I absolutely LOVE!!! ), so the only thing I bought was some brown wool Alice dyed for me for a rug I'll be making for a Christmas present. Bobbie had the most wonderful small cupboard ~ not antique but made to look old ~ even had square nails. I'm sort of kicking myself for not buying it. I got back to Oberlin to the dog event 45 minutes before it was over. Oh, yeah. We took a different route home and had another detour and then missed the state route we wanted. Not a good day for driving. I think they thought I wasn't coming back for Marvin...lol! I'm hoping someone met Marvin and fell in love with him. 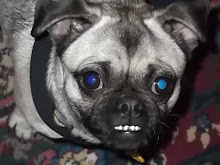 We haven't had too many "issues" lately, but he still does growl at me on occasion ~ so un-pug like! The rest of the day was spent playing catch-up, doing my Mom's laundry, and all those other mundane tasks that need to be done. As usual, the cleaning fairy skipped my house! For those of you who have asked about Frannie, I got an email from her new mom and she said Frannie is doing great and they love her to pieces. Hooray for Frannie!!! Thank you all for stopping by. Please come again soon. Welcome everyone. Fall is definitely in the air. The nights here on Ohio's north coast are very crisp ~ perfect sleeping weather ~ and the days are pleasantly warm and sunny. Oh, I love it! I thought I would share a few of my finishes with you. The little pug mat was hooked a few months ago...now it has binding. I've also been playing catch up with the punch needle pieces I've finished in the past. This is a Lori Brechlin design. I think I punched it back in 2007. A little bunny I also finished back in 2007. I guess I like that blue background! Another Lori Brechlin design. For punch needle, this is huge. It's about 7 3/8' x 9 1/2'. This too, was punched a year or two ago. And finally ~ ~ ~ my cat rug that took me 5 months to hook, though I also hooked the pug rug and a few punch needle pieces while working on this. It is by far my largest rug to date. It measures 21" x 33". The cats are from a Polly Minnick book and the background is my adaptation of the antique cats rug. The colors of the first picture are quite accurate. Now I just have to think about steaming and binding it. YUCK! As you've probably figured, I enjoy the hooking and punching part, but really don't like the finishing. I am now all caught up finishing my punch needle and hooking projects. That feels good and will hopefully inspire me to get busy finishing the cats. It will have a place of honor in front of my antique corner cupboard. I also started to work on the cat penny rug again. It shouldn't take long to finish if I set my mind to it. The weekend ahead looks beautiful so please enjoy it. Tomorrow there is a new craft/antique show at Malabar Farm in Ohio ~ a first time show but with high quality vendors. 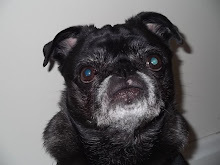 I need to shop quickly because I'm also working the Oberlin Doggie Do for Ohio Pug Rescue. Maybe Marvin will find his forever home. Thank you for stopping by. I don't really have "fall" decorations. I have lots of Halloween and a little bit for Thanksgiving. My decorations run the gamut from homemade, to craft show purchases, to imported, to tacky. I love them all. The witch was a birthday gift from one of my best buds. Isn't she great? The witch, that is. My antique step cupboard in the dining room. On the top shelf are ghosts I made about twenty years ago. The pumpkin on the top shelf to the left is one I've had since childhood ~ it's REALLY old! On the middle shelf are five paper mache pumpkins and a paper mache witch on a pumpkin, dating from the 40's, I believe. A close up of tin noisemakers in a trencher. Another close up view ~ this time of paper mache items. A gourd I painted a few years ago. These decorations are on top of the pie safe in the dining room. My dear mom (she's now 89) made the ceramic items in the 70's and early 80's. She did beautiful work and I will cherish them forever. I painted the scarecrow to the far right in 1975!!! These decorations sit atop the jelly cupboard, also in the dining room. About half the items are craft show finds (some of them were gifts) and the rest are imports. A not-so-little punch needle mat ~ a Lori Brechlin design. 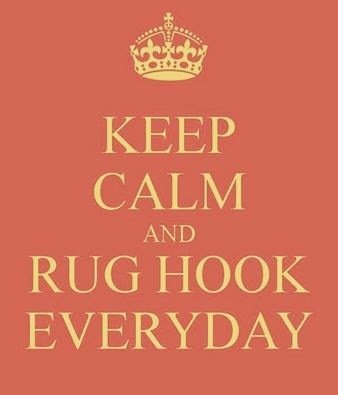 One of my favorite little rugs that I hooked a few years back. A wreath made by my younger son when he was in Cub Scouts. A few more things in the kitchen. The flying skeleton rug was an eBay purchase. I painted the gourd to the left. Don't you just love the green plastic tile? When I bought the house ten years ago, I swore it would be one of the first things to go! I hope you've enjoyed the ten cent tour of my Halloween decorations. Today in Ashland, Ohio, Pug Rescue was set up at an event to benefit the Ashland County Shelter. Usually fawn pugs outnumber the black ones, but today black pugs ruled! We had five black ones, one fawn male and a fawn puggle. Hopefully someone will have fallen in love with one of them and will apply for adoption. This was just a hoot. This wire haired terrier spent most of the afternoon riding on the back of the horse, sometimes facing forward, sometimes backward. Both the horse and dog seemed very comfortable. It was a sight to see. Yesterday was a great craft show at Quailcrest Farm in Wooster, Ohio. These guys (gals?) just cracked me up. Love the 'do on the brown llama. I didn't buy much ~ I could have, but didn't. 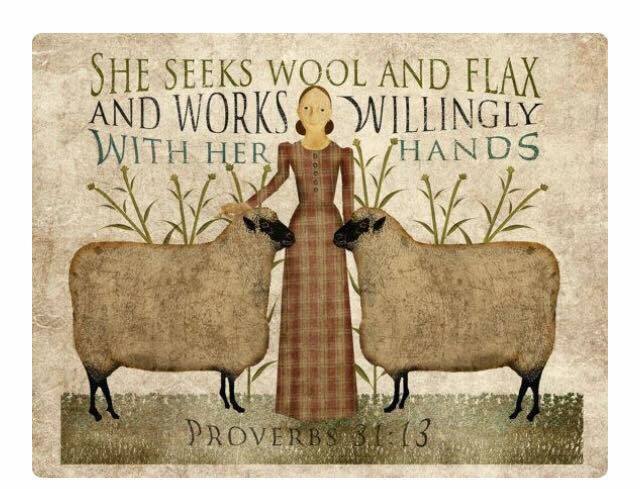 I bought some small dried gourds for a wooden trencher and some luscious wool from Alice (A Day in the Life ~ ~ ~). I also got a pressed glass goblet ~ a real deal for only $5.00 ~ most likely late 1800's. I have quite a collection and use them everyday. I spent almost five hours driving to and from the events plus the time at the events, and I wonder why I didn't get anything done this weekend. Go figure! The weather was picture perfect in Ohio this weekend. I wish it could go on like this until next spring...lol ~ but living in Ohio, I know better. Thank you for stopping and hope you all had a great weekend. Just a few pictures I took in the garden the other afternoon. Can anyone tell me what this flower is? For the last several years, I've had this vine grow in a little back garden and it reseeds itself every year. I have never seen it flower before. It is very unusual ~ unlike anything I've grown before. My cannas are doing well. It is the only tuber (?) I've ever dug up in the fall and replanted the following year. I've had pretty good luck with it. My hibiscus (what's the plural of hibiscus ~ hibisci?) were very late to break dormancy this year. In fact, I thought they had frozen out over the winter. I am so glad I did not dig them out. Two finally started growing and flowered, the third is still only about a foot tall. Not a great picture, but morning glories are one of my favorites. I have had the worst of luck trying to grow them in recent years. I'll plant dozens of seeds and I'll be lucky if one grows to flower. This year I didn't plant any and this is one that reseeded itself. I've been moving plants around in the garden and need to get a few mums for some fall color. I love pumpkins and gourds on the porch, but the squirrels destroy them long before Halloween. Any suggestions? I'm finally getting around to showing you what we saw and did on last weekend's get-away. We started with the Jubilee Museum and Catholic Cultural Center in Columbus, Ohio. The museum is open by appointment only, so it was just the museum curator and us. There is no charge to visit the museum. It was founded in 1998 as a repository of Catholic artwork. It is currently the largest collection of diversified Catholic artwork in the United States. You don't need to be Catholic to appreciate the beauty of the objects. The pictures can all be enlarged to see the detail. A host was put in the monstrance and used for benediction. Various stained glass windows from demolished churches. The middle zuchetti was worn by Pope John Paul II. The entrance to the Air Force Museum at Wright-Patterson Air Force Base. We spent the entire day in the museum. It is huge ~ three hangars full of planes, floor to ceiling. There's also an IMAX theater that we did not have time for. Another no charge museum! There really are some unusual looking airplanes! From the Air Force Museum, we headed into Dayton. Unfortunately by the time we got there, the Wright Brothers Museum was closed for the day. A beautiful Asian (?) Catholic church in Dayton. I was disappointed we could not go inside. This is the Ohio State Reformatory, also know as the Mansfield Prison, which opened in 1896. At that time, they believed they could reform the inmates by teaching them a trade. It is a beautiful old building that was slated to be torn down until a group of citizens formed a preservation society, bought the building for $1.00, and are now trying to restore it. Many believe the prison to be haunted (including our tour guide) and they do offer ghost tours and overnight stays. I don't believe in the ghost part, but it is way too creepy to want to spend the night wandering the building with its peeling paint and lack of heat. The prison has been featured on TV ~ Ghost Hunters, I believe it is called. Movies filmed at the prison include Harry and Walter Go to New York (1976), Shawshank Redemption (1994) and Air Force One (1997). Looking down the cell block hallway. An ornate bench carved by one of the inmates. Not the real thing, but as seen in the movie, Shawshank Redemption. We stopped in Lebanon and visited the Golden Lamb. You are able to walk through the hotel and peek in all the rooms. It houses a wonderful collection of antique Shaker items. I really struck out antique-wise. I always like to buy something to remember my trip, but all I ended up buying was a $4.00 treen container to add to my collection. Nothing too exciting. I also bought a pig bottle, also known as a codd bottle, as a little thank you to my DSO for taking me on the jaunt, but I forgot to take a picture of it. One day, I will have to do a little post about pig bottles. It's just an interesting little tidbit. I did find LOTS of things if money was no object, but like the rest of you, it is. I found prices to be high, or maybe I am just out of the loop. We also spent a few hours in Waynesville. The town is full of quality antique shops, handmade furniture stores and the like. Karin, I did stop at Olde Glory (and here's picture proof like you wanted...lol!). It was a wonderful shop full of very primitive antiques. Even if I had the resources, most items would have been out of place in my 1940 colonial. I hope I have not bored you with too many pictures.